Thank you again the incredible members of the Twin Cities improv community for putting together another amazing Hangout Auction to support our weird little home! Thanks to everyone who fought and clawed and won – the Hangout Auction raised a grand total of $4296.40 to support HUGE Theater ! ATTENTION SUNDAY STUDENTS – We are cancelling all Sunday 4/15 classes and rescheduling for 6/17. Thank you for your understanding. Your homework assignment for today is to do an improv scene with a snowperson…. at 8:00pm in July and August. turns that college brings, up until that last day. – Saturday April 14th – 10 a.m. – 3 p.m.
– Saturday, April 21st, 10 a.m. – 3 p.m.
rehearsals are located will be communicated to performers in a timely fashion. you are early in your improv career, this would be a great project to audition for. the past and each other to create a fun and engaging team and performance. At auditions, please bring a strong sense of play, support, and creativity. celebrate everyone’s experiences and what they can bring to the table. Improv is for everybody. In an effort to get more people of color aware and interested, HUGE Theater’s diversity officer John Gebretatose is hosting a POC improv jam. This is an opportunity to meet new people, to create, to play together and to help start a new era where people of color are represented more on stage. All ages and free of charge, sandwiches provided. Please come as you are, that’s more than enough. Includes an introductory workshop on improv followed by some scenes on stage – participation is optional. The POC improv jam is a relaxed and non intimidating event. Why is this event for POC only? Since it’s about having representation it makes sense to have a space where people can feel they’re important and deserve to be in the room. The value to having a non white POC jam uplifts marginalized groups. Also, there’s other events for that. A lot of them. Got questions? No problem, email John Gebretatose at john@hugetheater.com or visit the Facebook group. If you don’t already know, get ready to know – at HUGE we’re devoted to diversity and inclusion. It’s a goal and a process. Along the way, we’re fully aware and ready to admit that we have made mistakes in the past and it’s very likely we’re going to make some more mistakes in the future. The following is not the story of blaming or admonishing one production for mistakes that were made, it’s an account of some recent mistakes and lessons learned as we work to recognize our blind spots before we veer into them next time. [ BEFORE WE START : Four white people wrote this. For readers of color, these learnings will likely be obvious to you. We recognize the place of privilege from which this note is written. We sought advice from our colleague of color (diversity and inclusion director John Gebretatose) to help us see around our blinders. We recognize that what we’ve learned has come at the cost of a lot of emotional labor from our colleagues and performers of color – we want to make sure that effort reaches more people so we can all do better in the future. Thank you, again and always, for your patience with us while we get there. We are writing to a mostly to a white audience of improv producers and directors. Our goal is to help us all do better recognizing our privilege and create more inclusive spaces. Party Riot is an independent production, supported by HUGE Theater, as are more than sixty percent of our weekend shows. The leadership team of Party Riot as well as HUGE Theater are almost entirely white. Over the course of rehearsals, concerns were raised by women of color about their experience and communication difficulties. The original show promotion artwork design featured an abstracted image of a woman of color as the only human image representing the show featuring a small (but still greater than any other previous show) number of women of color – when paired with the title created a negative connotation. The original artwork was scrapped when concerns were voiced – it was never used – HUGE Theater leadership also failed to flag the design it when it was sent to us. The production team of Party Riot held several meetings to involve the entire cast, listen to concerns and repair the process moving forward – new artwork was created for the show that featured photos of actual cast members that emphasize the positive aspects of the show’s original intent. HUGE Leadership met with show leadership to improve communication.We also contacted the Party Riot cast directly via email to make sure they know we’re aware that we could have done better from the beginning and make ourselves more directly available going forward. 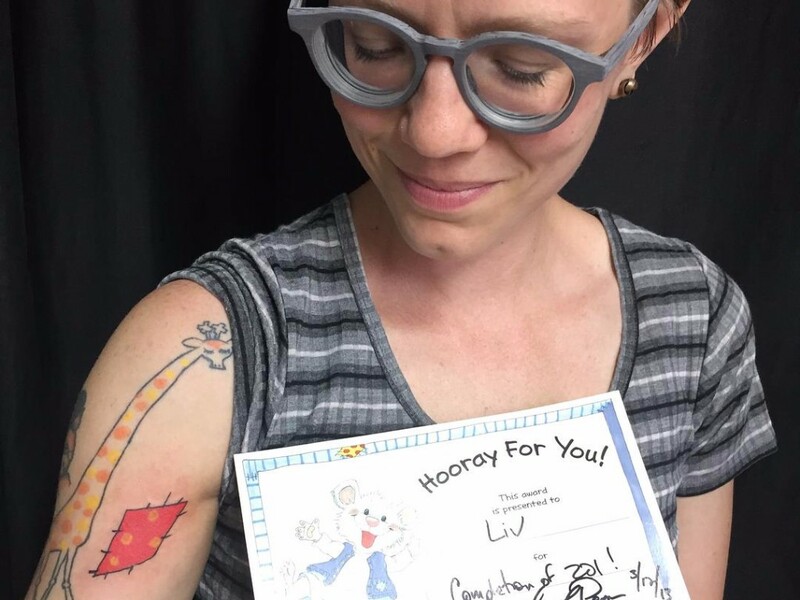 We also let the cast and production team know that this public post would be coming – it is a hard lesson, and we know more producers can learn from it. The Party Riot leadership team and cast continue to work together – The show opened at the beginning of January to a packed house and brought. the. house. down. Here are some things we as an organization learned from this experience about being effective (and sometimes failing) in meeting the challenges of creating a space that truly supports – in addition to valuing and encouraging – diversity and inclusion. Not understanding the limits of good intentions without immediately providing support and infrastructure for change. Not anticipating or recognizing that “safe space” is not the same for all performers, and needs to be defined so that people of color feel equally celebrated and supported. Not recognizing and flagging a combination of image and title that showed an icon of a person of color only, paired with blindness to social and cultural issues of race in relationship to show title. Overall, the need for greatly heightened transparency and care – as well as being more visibly available to our independent producers and casts as well as shows directly produced by HUGE. Support mechanisms need to be more accessible to work better for everyone. In the future, when productions begin, the theater will ask for the contact information for the cast so we can give them logistics (show guidelines, comp instructions, etc.) as well as giving everyone a direct channel to reach us if they experience problems or have concerns. The simple fact that women of color felt they could bring these issues to our attention — and did so — is tremendous. We have to thank them for bravery atop of courage atop of trust atop of patience. Again. We are so very thankful you are here. Thank you for giving us another chance to do better. We will do better. The fact that director of diversity and inclusion John Gebretatose works tirelessly to make himself available. He does this both as a person that performers of color can reach out to at any time, and also to patiently sit down with the HUGE team and walk us through (some of) our blind spots. His dedication and endurance are such a gift to us all. We recognize that there are communities that would have to put in years of work to reach the point where it would even be possible to make mistakes like these. We truly appreciate that people are willing to take risks and do the work, and we want to do whatever we can to make HUGE feel like home to everyone. The fact that Party Riot is pushing forward and doing the work – before, during and after mistakes were made. These mistakes happened because the show producers are trying to make this art form more inclusive – we all are. The process is not simple or easy or painless but absolutely necessary. We are pleased to say that Party Riot is running Saturday nights at 8pm at HUGE and they’ve done hard work to rally around and expand their mission. Please support these courageous improvisors. We are open and we are working to do better. Today we’re remembering Samantha Pereira. 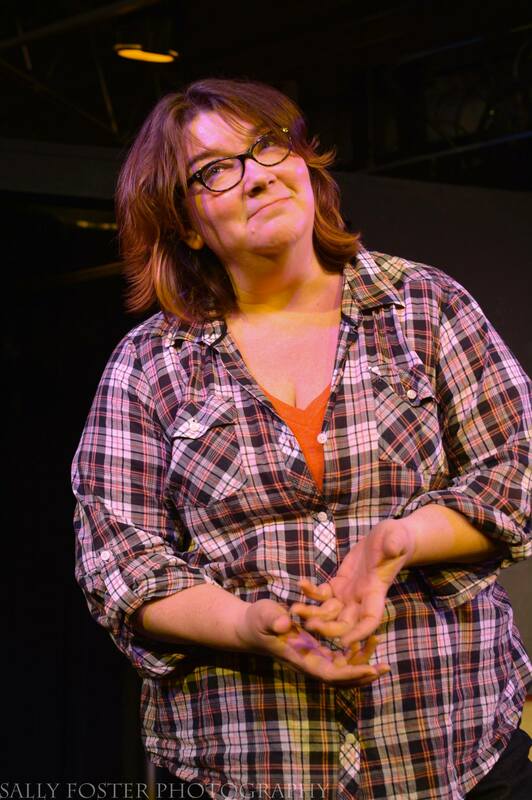 Samantha was a HUGE teacher, performer, director who passed away in December 2015. If you never had the good fortune to meet her, you can read about her here in the Star Tribune. It seems impossible that almost two years have gone by. At HUGE Theater, we feel Samantha’s absence powerfully, especially the first Sunday of every new class session or when we glance up at Samantha’s photo on our theater wall. One of our classrooms is dedicated to Samantha with a plaque we thought she’d find most fitting: The Improv Jedi Training Center. This year HUGE Theater is making a donation to Puerto Rico hurricane relief in Samantha’s honor. Love for Samantha expresses itself in lots of ways. 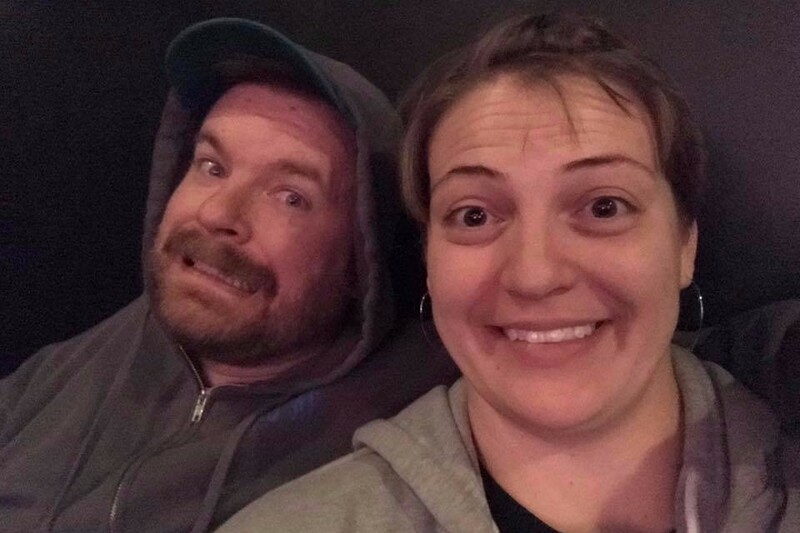 Her former students, Erik Nielsen and Gubby Kubik (pictured here, during Improvathon), have honored her for two years in a row by dedicating their Iron Audience participation to Samantha, who herself was an Iron Audience participant, which requires staying awake and watching 28-hours of improv as part of HUGE’s annual Improvathon fundraising event. Samantha is pictured on the left, in 2014. 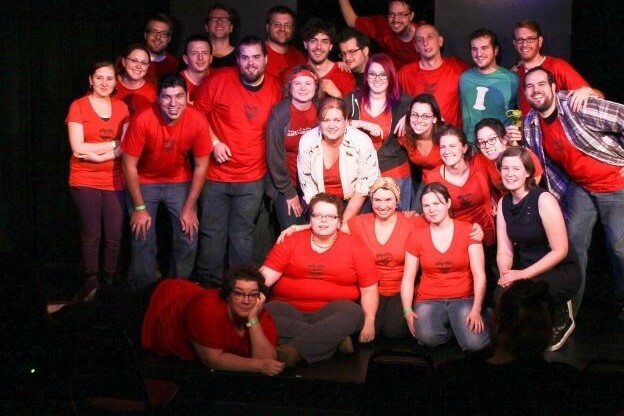 She not only completed 28-hours of watching improv, but was the group’s cheerleader and champion. Samantha had a special interest in making improv available to everyone. Each semester since her loss, we have named a Samantha Pereira Scholar: someone who is a scholarship recipient of exceptional merit. The following people are just the sort of students Samantha would have cherished. Beginning on Wednesday November 15th and running until just after midnight Thursday, November 16th – a 28 hour block of time lovingly known IMPROVATHON – HUGE Theater held our annual improv marathon to raise money on Give To The Max Day 2017. This is a crucial day for HUGE Theater – it is a wonderful event that features not only 28 hours of performances but also an amazing chance to connect with the community as we all spend time in (or passing through) the same space and telling everyone we can collectively reach what this place and this art form mean to us. Thanks are not enough to convey the love and joy that go into – and come out of – these crazy hours, but I will give it a shot. Our amazing Iron Audience were in the seats the entire time and there were more than a few surprises along the way – You really did have to be there. Once again we thank Common Roots Catering and Steamship Coffee for all of the caffeinated liquid support they sent our way – there are few things as important to being awake and energetic and upright and on stage for 28 hours as caffeine. Please help us thank them! The Improvathon is more than a giant love-fest – it’s also a competitive love-fest! Thank you to everyone that helped, volunteered, posted, tweeted, watched, ushered, cleaned, brewed more coffee, staffed the box office, took photos, performed and made us weep with joy. If you aren’t familiar already, Give To the Max Day is THE fundraising day of the year for HUGE as it is a focused day of charitable giving across Minnesota made possible by GiveMN. This year GiveMN helped raise more than twenty million dollars for non-profits across our state! HUGE focuses all our energy and efforts on this day – and this year we aimed even higher with a goal of $75,000 – which we did not hit but I am so proud that we went for – it was less than a decade ago when having a theater for improv was a crazy dream and asking people to give to this cause felt impossible. But nobody has as much fun doing the impossible as we do. Trying to get this post written is always challenging – it takes many days for our brains to start working and words to start having meaning again – but trying to wrap it up is just impossible. The screen gets all blurry and my keyboard keeps getting all wet. “This place is important because of the people you will find here. I am so proud to be part of this place. A changing part of an ever-changing place, as I got to (finally) announce that this is my last Improvathon as the President of our Board of Directors – as of January 2018 the gavel is handed to the amazing Adia Morris-Swanger ! I am so proud of the work we do here and the difference it makes in between (as well as during) the times that we have to play together here – as a community that is maturing and growing and learning and sometimes leading the way for others in our art form. I am so proud that I can serve this place that serves this community – It has been my greatest joy and most humbling experience – and I could not be more grateful for everyone that has been moved to support it. My thanks will never feel like enough so I lean on the words of others. Find the people in the same place as you who want to build the same things. Ask them what they’re interested in, ask them what they’re making, and ask them if you can help. …Start talking. Start building it. Make it calmly, and make it complex and inclusive. Make it real. Make it human. Make it weird and wonderful. Thank you all – I am luckiest because I get to build this with you. We are extremely excited to announce the cast of the upcoming season of our annual Throwback Night shows – thank you all to those who auditioned! Throwback Night casts begin working in October and the show opens January 5th! New ticket pricing and options! Starting Friday, November 3, weekend ticket prices and purchase options are changing. Audiences can purchase tickets for one, two or all three shows on Friday and Saturday nights. The 8pm/9:30pm show tickets are no longer bundled together. 1) Customers have consistently been confused by the combined 8pm/9:30pm ticket model. 2) Our audiences and programming are seasonal. We originally set up to our 8/9:30pm combined ticket model to encourage audiences to stick around and sample improv. This was essential nearly seven years ago, when HUGE opened and longform improv was very new to the general public. Now we’re finding new audiences express much more confusion about our ticketing than our programming. We recognize that theater attendance is seasonal and that we attract different audiences at different times of year. Our programming reflects this — we roll out new programming every two months or so — but our pricing model hasn’t caught up. Rather than treat winter the same as summer, we are treating the seasons, well, seasonally. Our goal is to make sure, no matter what the season, our ticket prices are affordable and as clear as possible. If you’re reading this, it’s likely you’re a longtime friend and audience member at HUGE. Thank you! Many of you have become accustomed to seeing multiple shows, and we hope this change won’t keep you from being able to join us. We’ve had you in mind in designing the Flex Pass (any two shows) and the All Night Pass (all three shows). long-time audiences. To be honest, we’ll miss the wooden nickels and the ease of having audiences stick around between shows. At the same time, we won’t miss giving lengthy ticketing explanations online, at the box office and from the stage. We’re also excited that the 9:30pm shows won’t have to encourage their audiences to come to the theater in hopes that enough audience turns in their wooden nickels from the 8pm show for new 9:30pm audience to get a seat. Going forward, we’re going to adjust our pricing seasonally, to best meet the needs of audiences and performers. We appreciate that you’ve stuck with us so far, and hope you’ll continue to support HUGE. We don’t do anything without considering how it affects our community, and we want you to know we truly welcome your feedback and, always and forever, appreciate your support.